Meet Lydia. 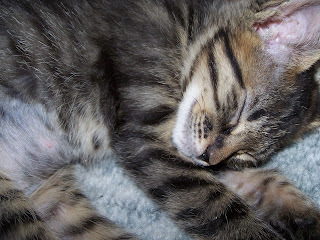 Tiny new kitten. 1 lb 13 oz when we got her last week. Sweet and fast. 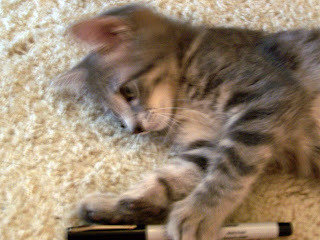 The second pic shows a pen for scale but is blurred by her fast movement. She is about twice the size of her little sister. Meet Mai Mai. Devil cat. So tiny she fits in a teacup. 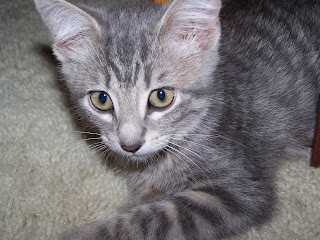 1 lb 3 oz when we got her. Neither cat can meow, they still just squeak a little. 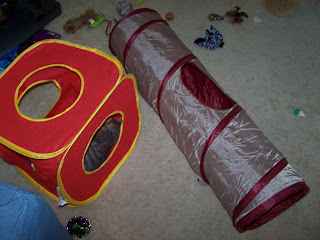 Play is furious for 3 two hour sessions a day followed by collapse. 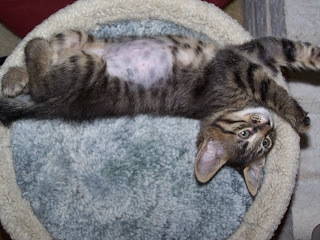 And, of course, all kittens need toys. This is just after play has ended. Mayhem. Some knitting happens during sleep. This is the last row of Aeolian. I am really wanting to work on Mara, but that is too attractive right now for them. Cats like Shetland. 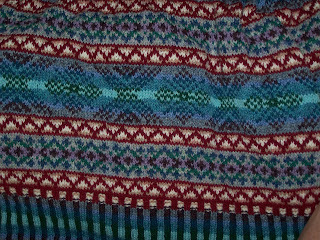 Goddess Knits Anniversary Mystery shawl is so nice. But Zephyr yarn is easy to bite through. So I shall be even slower than normal but happily playing with my new distractions. Today I shall introduce them to the looms and see what happens. 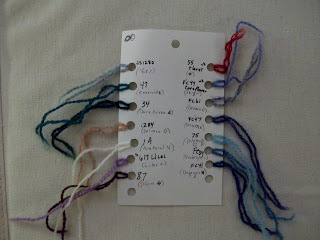 I knit a lot in public, often at distracting concerts, and needed to simplify my process. 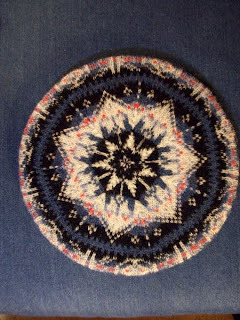 When preparing for a long Fair Isle/stranded project, I start with pattern. 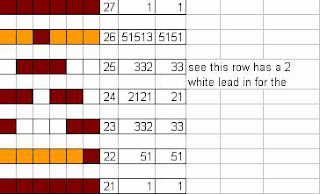 I usually have charted in some software or graph paper, but after I settle on the chart, I move to excel. 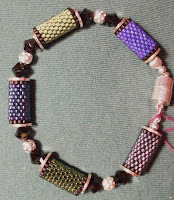 I make the color card and pattern bundle. Notice that I add the color name and the count? The count has two forms, short and full. 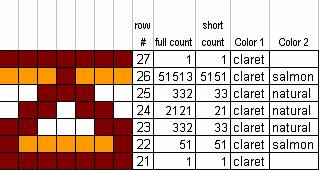 Short gets repeated across the row, counting right to left, just as you knit. Full give me the lead-in for a particular row. See row #25 on the second chart. 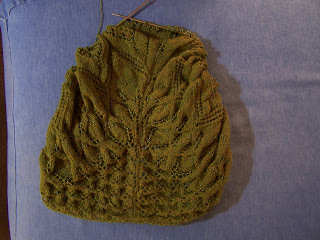 While I am not thrilled by the color choice on the top of the tam, this sequence doesn't come up in the sweater. 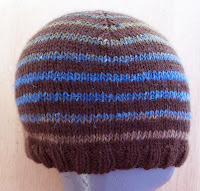 The side of the tam has the XO pattern and is a fine gauge swatch. Of course, many of you recognize Mara. Meanwhile, fiberguy has been very busy cutting away on a semi-secret quilt project. Huge amount of cutting, but he is very organized and chugging along. A nice block in the background is partially finished. 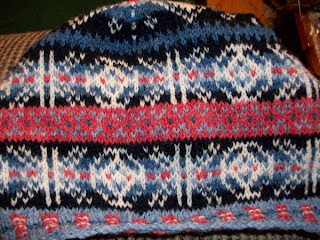 While working a sweater in Fair Isle or Stranded Knitting, one often has 15-20 balls of yarn to keep straight. Not only do you have to have the colors correctly identified for the different bands, but you also have to prevent tangling. Some wonderful blogger had this tool but I just can't find her blog's link. I had it on my 'wanted' list for about a year and a half and finally indulged. It is better than I could have ever imagined. The original purpose is to store cups or other small items. It folds completely flat and I could have opened the last section for more yarn, but chose to unsnap it for my color card and notes. 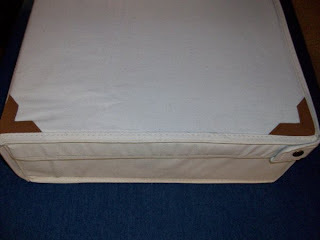 Once closed, I can store it on the side or even upside down and nothing is disturbed when I reopen the case. I can't express my joy at this wonderful tool. 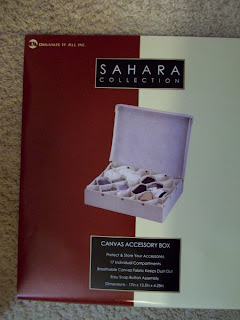 It is called a Canvas Storage Organizer and costs under $20. 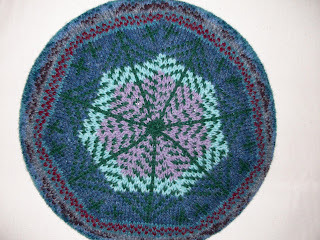 Mary Rowe's book Knitted Tams has long inspired me. But I never made anything out of her book. I used her methods and made many a tam. I have read my book so much, the pages are all bent and thin - well loved. 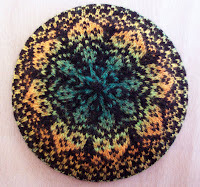 So in my sock procrastination knitting frenzy, I decided it was time to pick a project. I had yarn on hand, that is in stash, to make a charmer called Sweet Melodies. I had to guess at just what she did for ribbing, peerie and length. However, when I look at her blocked tam in the book next to my blocking tam, they are pretty close. 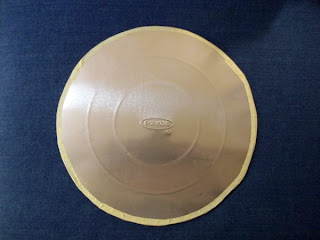 For those tam virgins, you will need a blocking board for this to make the shape stick. 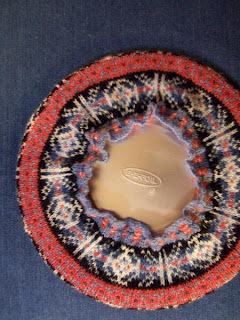 I use a very low tech item that I made 15 years ago or more when I first learned how to knit them. I got two disposable pizza tins from the grocer and a piece of cardboard. 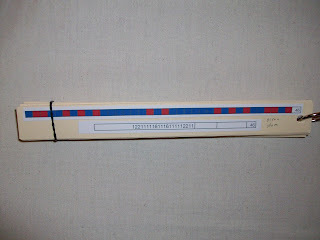 I cut the three to 11.5" and used masking tape on the edge. It works well and hasn't fallen apart yet. Fancy, eh? 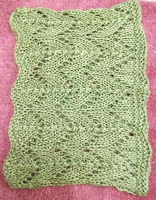 When I block, I first wash my tam to remove any hand oils and dirt from knitting and stretch it over the board. the ribbing will appear quite ruffled at first but I suspend the tam blocker over a can of soup and it pulls right in overnight as it dries. One note, you will have ends to weave in, or at least, I will. I usually steek Fair Isle sweaters and hide my ends in the steek section. But here I weave into the floats. 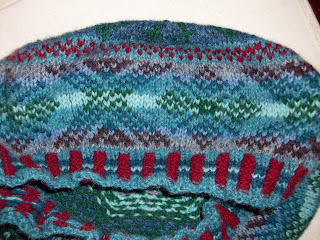 First, it is Shetland yarn, all clingy, and will hold the ends. 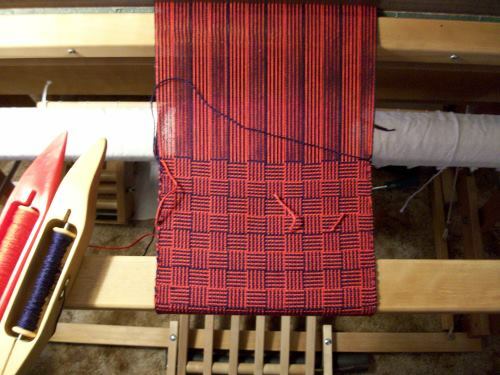 Second, I don't weave as I go since it can show and the background is often dark. It only took about 45 minutes and I am so much happier with the product. I gently pull my ends to the left and right to see which way to darn them in that closes, not opens the hole made when I change colors. When done properly you will have a hard time figuring out on the right side just where the colors changed. 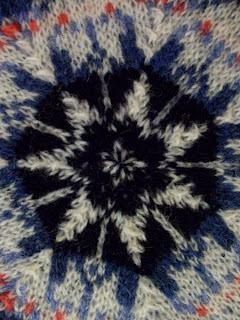 I am also working on swatches for the Walker Treasury Project and did finish a project for the upcoming Spindlicity. 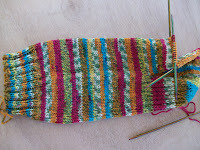 Oh and two more socks are coming along. One of these is hideously ugly. Almost like a bad B movie - so ugly I am compelled to continue. It seems I have wicked startitis. Luckily, I also have wicked finishitis. Oh, and everything is from stash. Well my socks went forward and then back again. I made this whole pair in the wrong gauge. I knew it was wrong but persisted. And I screwed up the tops. 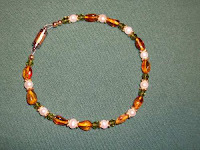 Oh, and the color - I got it for Steelers colors but there was green. It was too much. Now, it is ripped and overdyed with some old koolaid I wanted to clear out of my dye cabinet. Nice and mottled, as I hoped. I like them now and am ready to reknit. Lornas's laces Bee Stripe before and after. 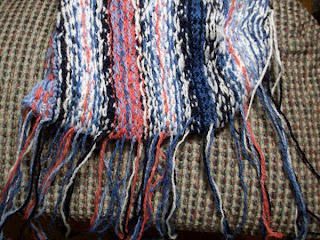 I still have the same damn project on the loom, but I am not hating it yet. I made a huge miscalculation when I put on the warp. I used a different method of winding an screwed up so the warp was 4 times longer than I wanted. You think I would have noticed, right? But I was so thrilled to get the (new to me) loom setup that I just slapped that puppy on. 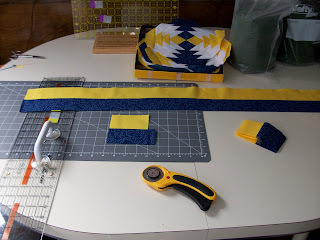 So I am weaving and weaving and weaving. It will be very long and narrow. Lastly, since someone asked me about it, I thought I might show one of my home made electric wheels. I have it set in bobbin winder mode right now, but I can just pop out the stick and pop in the flier. I have a folded loom behind it, and a yarn counter on the table in this rather poor photo, but you can get the gist. I built it on a really thick and heavy spiral staircase step of solid oak that a woodworker in my old neighborhood was discarding. My luck to find it as the solidity helps stability. Anyway, it has always worked so well that I never really prettied it up. It has been used very often since about 1993, I think. It lives in the corner next to my loom and I can change it for plying or spinning pretty fast, but I built another electric wheel for plying exclusively and so this is now one of my winders. Foot pedal. Reverse by twisting the drive band (on a drawer pull). 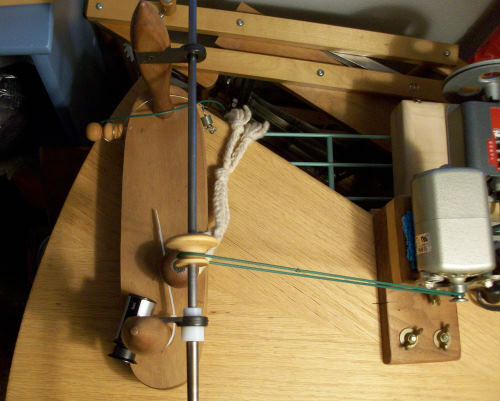 In line with both swift, ball winder and cone holder. I admit it, I am a spoiled sock brat. As a spinner, if I want a luxury sock, I can just build it. Jacob combed with yearling mohair? No problem. Angora, silk, merino: easy. And we must not forget the lovely Romney/baby alpaca. But you know what these fine blends all have in common? They all get handwashed. Well, it is time for a change. For my birthday, I promised myself 7 pairs of socks that I can toss right in the washer. Simple commercial yarn FROM MY STASH that are everyday handmade. And while I still use my fancy handspun joyful socks, at least I get a day off occasionally from handwashing them. It has been fun. 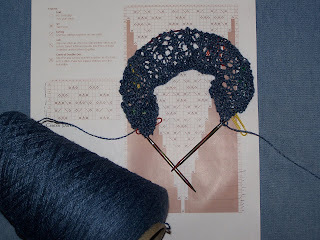 I discovered Kroy yarn - gee why didn't you tell me about that? And I am using up some dubious choices I made in the past. 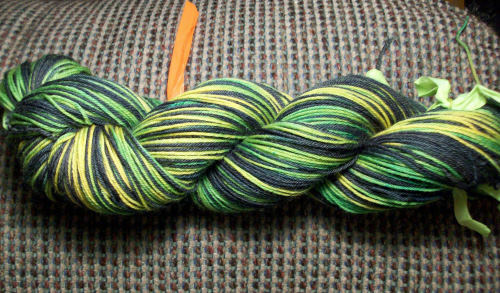 Like the bumble bee yarn that was to support the Steelers, only to find it contained green - the wrong color. Still the socks will be better than commercial white ones that never fit very well. I have finished 3 pairs and have two more single socks done. I suspect I will go over my 7 sock goal too, and before a month has passed. 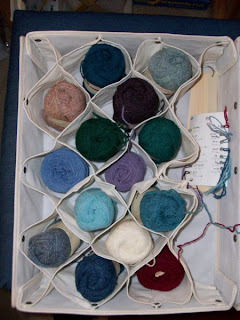 Then I will have cleaned up my yarn storage area a bit, turned it into east care garments and can get back to some fancier spinning and knitting and spoiling. 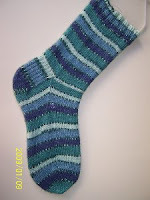 Sock one is Kroy Cyan Stripes done at 64 stitches on 2.75 knitpicks wooden DPs. Sock two may be some old Magic stripe at 72 sts on size 1 metal needles. Sock three is interesting. It was from a massive cone of carpet yarn I bought on ebay for felting - kinda feels like a cross between Romney and Shetland, very pleasant. However this stuff won't felt. I am quite sure it is pure wool. I had intended to use it for some class I was teaching. 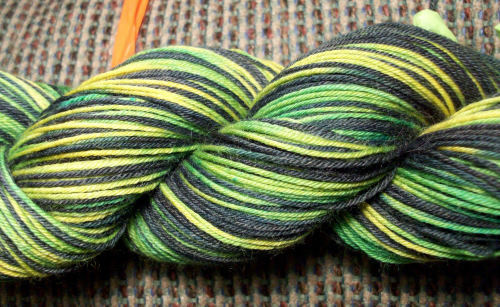 Now, I toss a skein in every time I dye. 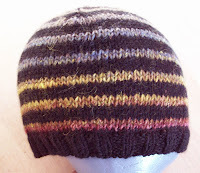 The yarn has the most pleasing feel on the foot, which is good since there's about 10 lbs left. Anyway, 64 sts on 2.75 metal unknown needles. Ribbed.